Mid and top end profile. Requires Exhaust System, High Compression Piston, Performance Valve Spring Kit VC-P03, and New Followers CF-P01. Check ALL clearances! Price Per Set (2). 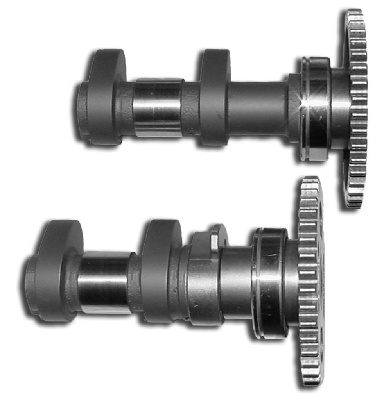 The NC42 is now available directly through Web Camshafts. Excellent race profile to increase mid and upper end performance. 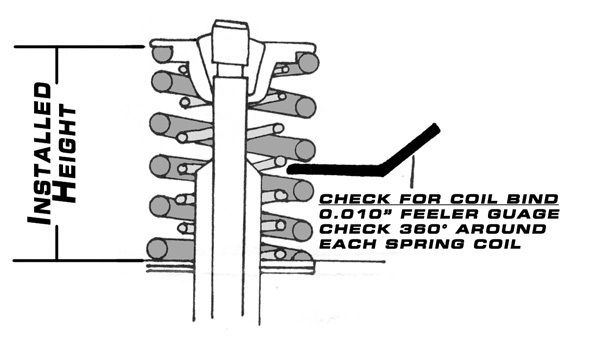 Requires Exhaust System, High Compression Piston, Shim Under Followers CF-P01, and Performance Valve Spring Kit. Check ALL clearances! Price Per Set (2). Race profile designed to increase mid and upper end performance. Requires Exhaust System, High Compression Piston, Performance Valve Spring Kit VC-P03, and New Followers CF-P01. Check ALL clearances! Price Per Set (2). Bolt in profile increases throttle response and overall performance throughout RPM range. 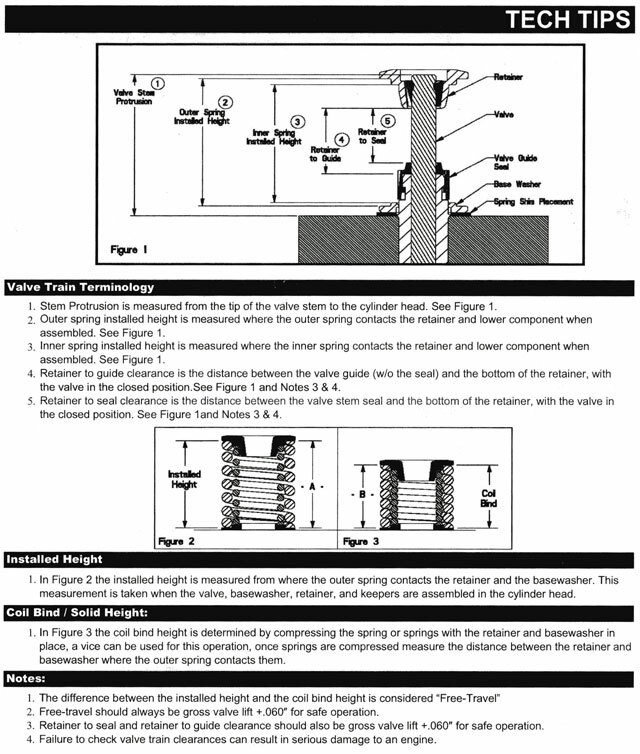 If using hi rev box must use Performance Spring Kit VC-P03. Recommend New Followers CF-P01. Price Per Set (2). 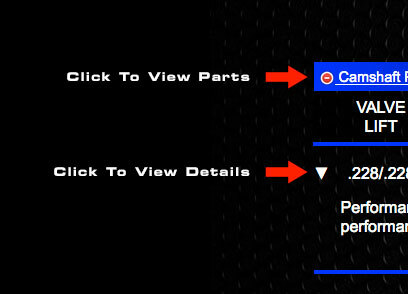 The NC24 is now available directly through Web Camshafts. Excellent mid and upper end performance. Requires Exhaust System, High Compression Piston, Performance Valve Spring Kit, and Shim Under Followers CF-P01. Check ALL clearances! Price Per Set (2). Excellent mid and upper end performance. Requires Exhaust System, High Compression Piston, Performance Valve Spring Kit VC-P03, and New Followers CF-P01. Price Per Set (2). Kit includes performance dual springs and Titanium retainers. Must use stock bottom. OK up to 0.440" valve lift. Check ALL clearances! Price Per Set (4). Standard size 37 mm. Price (Each). Oversized to 38 mm. Price (Each). 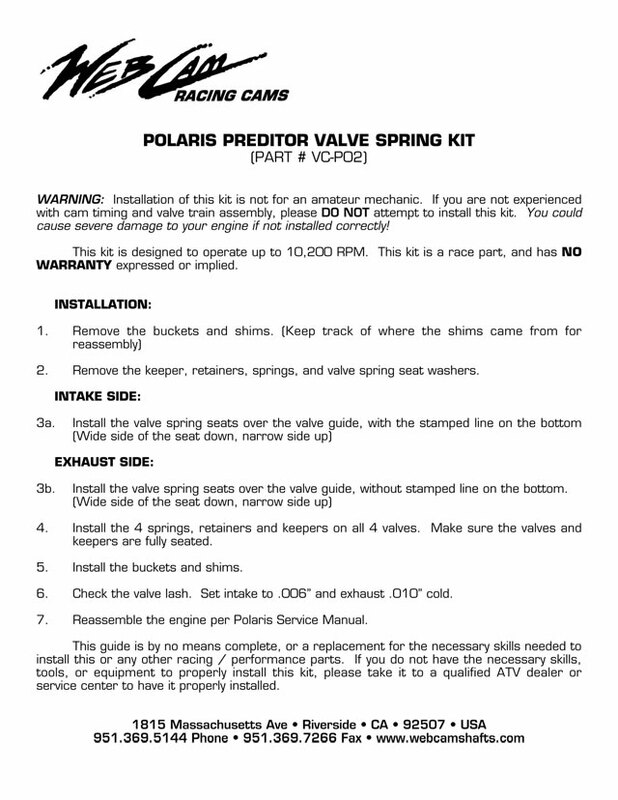 Polaris Predator 500 DOHC 4v Parts List.